Saddle up your Stang with XADA’s Lonestar shift knob and “Gitty up”. The Lonestar sports a hidden sealed compartment that is accessible by unscrewing the triple chromed star top from the black anodized base of the shifter. The Lonestar gives your interior a first-class finish through the brilliant star that resides on the top face and the ergonomics of the shift knob lend well to everyday driving. The hidden compartment is virtually undetectable to passengers or bystanders. CNC machined from billet aluminum with emphasis on a sleek finish that will integrate well into any mustang interior. 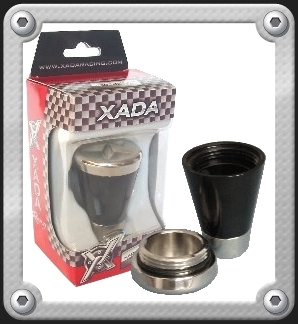 All XADA shift knobs include CNC machined plastic adapters to provide OEM quality fit and finish for ’79 to ’07 Mustangs. ‘05+ adapters are designed to integrate seamlessly with shifter boot and shift knob. XADA strives to provide brilliant finishes, unique designs, and exact tolerances that will define the new standard of value and quality.